If you need a car rental in Stara Zagora, then use Val and Kar Rent a Car service. It is a rental car company with years of experience, serves all airports and bigger cities in Bulgaria and the neighboring countries. It has new rental cars of all sizes and categories, from the smallest to station wagon, SUV, vans and nine seats minibuses. The company pays attention to the individual customer and makes deliveries of the car from the reserved class and to a destination of your choice. Especially for our customers in Stara Zagora and the region, we deliver the cars to a requested address. The duration of the rental contracts for the region of Stara Zagora should be at least 7 days. It is necessary to make the reservation at least 24 hours in advance. Our business hours are from 9:00 to 18:00 except Sundays and national holidays. Do not forget that if you land or depart at Sofia Airport you can make a reservation in advance and we will welcome you directly at the airport with your chosen car. In this way you will save the delivery fee in case you have ordered a car which is not available in the region of Stara Zagora. Please visit our site, browse the rental cars we offer and get acquainted with the additional terms and conditions. Fill in all the details of your request - date, time and place of pick up; date, time and place of return. You have to choose a car that's right for your trip. Customers often choose a rental car at the lowest price without considering the size of it. Take into account how many people will be and how much luggage there will be, regarding the size of the car you choose. You have to decide if you prefer manual or automatic transmission for the car you will rent. When you browse our cars, apart from the basic characteristics, there are indicated the number of passengers and luggage that it can hold. If you are more passengers with more baggage, or you will be a few families, you can take advantage of our offers for vans and minibuses to rent. Inform yourself about the additional insurances that we offer that are Super Cover for Damages and Super Theft Protection. They are not mandatory but we recommend them to our customers when hiring a car from us. In case you are traveling to countries other than Bulgaria, you must indicate this in advance and specify the countries you are going to visit. With Val and Kar rental you can travel anywhere, but we need to know which countries you will go through in order to prepare the necessary documents for you. In case you need any additional equipment, you have to pre-order it so that we will be able to supply it together with your car. The Val and Kar Rent a Car team can always assist you in choosing a rental car. You can ask your questions through our online form, by phone or by email. Once we have specified everything necessary, you can choose how you pay the rental price and how you leave the deposit or liability. Car rental can be paid with credit or debit card, online through our website, via bank transfer or in cash. When paying online or by credit / debit card, you will not be charged any extra fees for this. Deposit or liability can be left by credit card or in cash. The employee who delivers the car to you will show you the car and its specifications, he will answer your questions and assist you with anything you need. 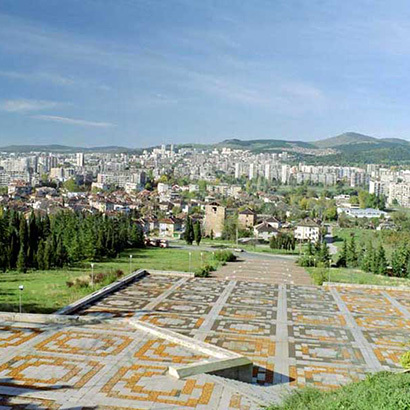 When visiting Stara Zagora, one of the main economic centers and a major transport hub in southern Bulgaria, do not forget to see its sights: Augusta Trayana temples, Stara Zagora Regional History Museum, Eski Mosque, Hamza Bay Museum of Religions, Geo Milev House Museum , October 5 Park, Stara Zagora Opera House, Astronomical Observatory, Hilendarski Convent, Museum of Neolithic Dwellings, Zagorka Beer Museum, the Memorial Complex "The defenders of Stara Zagora", Ayazmoto Park, Stara Zagora Zoo, Central Monastery-lavra St. Teodor Tiron, the Laughing Hall, Zagorka Lake, Bereketska Mound, the Natural National Resort Complex Starozagorski Mineral Baths, etc. Val and Kar rent a car will highly appreciate your every car rental recommendation. And when you decide to use our service again, please notify us that you have already been our customer, because our regular customers enjoy preferences and discounts for our rental cars.